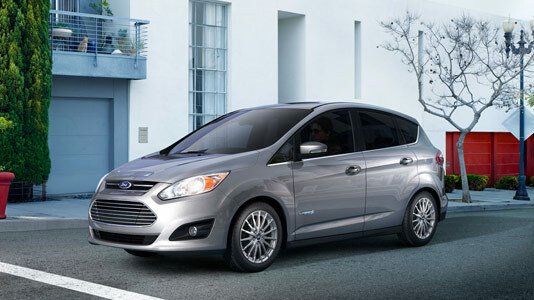 First impressions of the new 2013 Ford CMax Hybrid make it difficult to classify it as a wagon, hatchback, or a minivan, but it's a vehicle, that offers plenty of interior space and has incredible fuel economy. Ford started selling the CMax, built on the Focus platform, in Europe in 2003 with several engines, but in the U.S. it only comes as a hybrid. The hybrid was revealed at the Detroit motor show 2011 and the European launch of the hybrid is set to 2013. Doing so Ford takes aim at the Toyota Prius claiming to have better fuel economy. The Prius gets 44 mpg in the city, while the CMax claims to get 47 mpg both in the city and on the highway according to EPA. At the same time the CMax gets 188 bhp from its hybrid system, leaving the Prius behind with only 134 bhp. The superior handling of the CMax Hybrid comes from the Electric Power-Assisted Steering (EPAS). This steering system assists the steering effort to help you maintain a straighter path while helping you manage unwanted drifting and pulls. The CMax Hybrid also has a new powertrain, which includes a 2.0L I-4 Atkinson engine with an electric motor. This system gives the car 188 total horsepower, delivering the responsive power you want when you need it. After all a typical hybrid buyer will be more interested in maximizing the fuel economy than pushing the car to its limits. The on-board instruments cluster is called SmartGauge with EcoGuide and it's an innovative cluster that provides real-time information to help you get the most efficiency from your CMax Hybrid. Five-way steering wheel-mounted controls make it all easy to change the screens between Inform, Enlighten, Engage or Empower. The gauge can indicate instant fuel economy, fuel economy history, odometer, engine coolant temperature, miles to empty and much more. You can even watch the display grow leaves when you drive efficiently (and that's not a joke). You won't find Sport or Eco buttons in the CMax Hybrid, because those modes have no business with a hybrid focused on fuel economy. Offering better fuel economy and comparable interior space makes the 2013 Ford CMax Hybrid a real rival to the well-known Toyota Prius.